Click "ADD TO CART" now and wow the Bride with this adorable Mrs. _______ Bride Hoodie. STUNNING RHINESTONE PERSONALIZED BRIDE HOODIE! The Bride will love this luxurious and cozy "Mrs. _______" rhinestone hoodie. We'll personalize this Bride hoodie with her married last name (up to 9 characters. )This hoodie is perfect for wearing to the Bridal Party Spa Day, Bachelorette Party or while getting ready the morning of the Wedding. ALL SEASON STYLE! This Bride hoodie has a classy look that is perfect for any season. This stunning hoodie will keep the Bride cozy for fall and winter Bachelorette Parties or she can wear it while lounging or getting ready for the big day. A GIFT THE BRIDE WON'T FORGET! 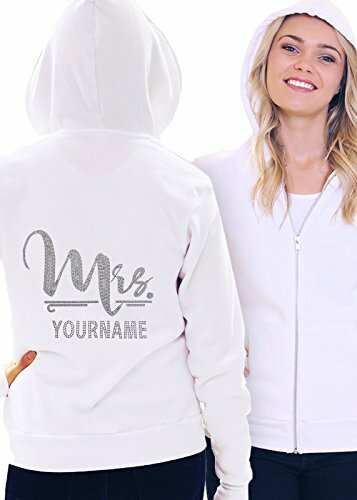 Click "Add to Cart" now and get this rhinestone Mrs. _______ personalized Bride Hoodie. The Bride-to-Be will love this keepsake gift.